Plantation firms like Asia Pulp & Paper and Toba Pulp Lestari have a long history of land grabbing, often dating back to the New Order military dictatorship. More recently, they have pledged to eliminate the practice from their supply chains. Many of the conflicts remain unaddressed. The companies say they are working hard to resolve them. A new online platform launched by the Rainforest Action Network shows that communities are still suffering the impacts of having their traditional forests and lands seized to make way for plantations. A new campaign by a leading environmental NGO offers a rare glimpse into the frontlines of Indonesia’s “deforestation crisis,” where communities are locked in land disputes with some of the world’s biggest pulp and paper companies. Beyond Paper Promises, an online platform launched by the Rainforest Action Network (RAN), tells the personal stories of people who have suffered land grabbing at the hands of two of the industry’s biggest names — Asia Pulp & Paper (APP) and Toba Pulp Lestari (TPL). Despite commitments from both companies to eliminate deforestation and human rights abuses, the campaign shows that communities are still suffering the impacts of having their traditional forests and lands seized to make way for plantations. “Promises to end deforestation and to address the now decades-old land rights conflict[s] are all well and good, but the fact of the matter is that we have seen little change on the ground so far,” RAN Senior Forest Campaigner Brihannala Morgan said in a statement. RAN said it chose to focus its campaign on APP and TPL because of the “outsized role” they play in land conflicts in the provinces of Jambi and North Sumatra. Since 2013, APP, the biggest pulp and paper producer in Indonesia and China, has committed to eliminating forest destruction, human rights abuses and clearing peat from its supply chain. RAN says the commitment was a welcome move from a company with a history of land and human rights abuses, and has resulted in progress, including the end of most deforestation and plantation expansion on forested peatlands on its concessions. But “major concerns” remain, with scores of communities still seeking a resolution for the clearance of their traditionally owned forests and farms without their consent. 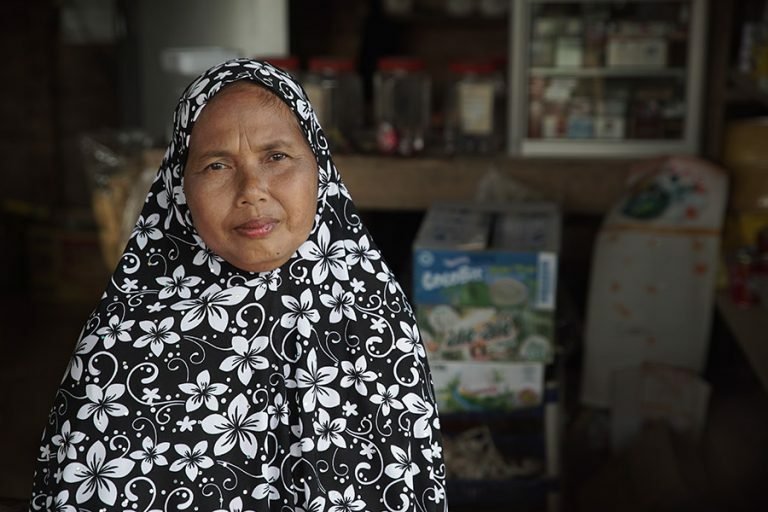 The story of Nurhotmahsari, a resident of Lubuk Mandarsah in Jambi province, is among those featured on RAN’s site. Image courtesy of RAN. 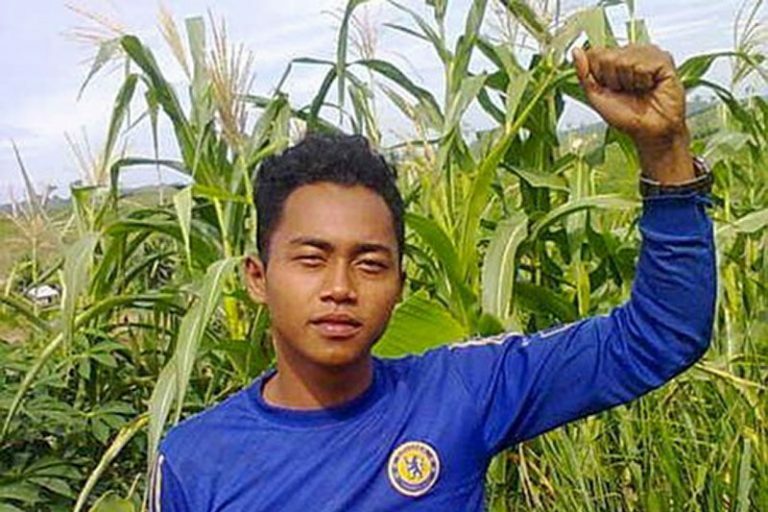 Among those given a voice by RAN’s campaign are people from Lubuk Mandarsah, a small ethnic Melayu farming community in Jambi, where locals are planting crops on disputed land as a method of resistance. The bitter dispute between APP and the Melayu community culminated with the murder of a local activist by company security guards in 2015. Since then, RAN says, “little has changed with the underlying conflict in the region,” with some 300 people now actively farming on land they have used for generations but which is legally part of APP’s plantations. “We want our customary land that we have reoccupied to be returned to us….If the company wants to resolve this conflict, all it has to do is simply give us back our land,” said Mohammad Jais of the Sekato Jaya farmers’ group. RAN’s platform also profiles members of indigenous Batak communities from across the Lake Toba region, where traditionally owned community land was taken by pulp giant TPL to be transformed into plantations to make material for everyday fabrics. In 2015, TPL adopted “No deforestation, No peat, No exploitation” policies, but RAN says these have failed to resolve the grievances of numerous Batak communities who have lost benzoin trees, which they tap for incense and are central to their culture and livelihoods. “We ask the government to protect us and return our Indigenous land to us. 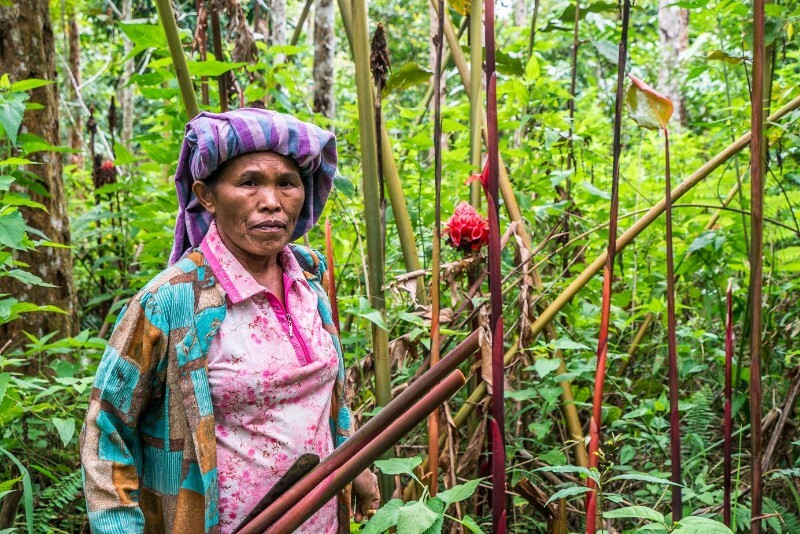 This land is the source of our livelihoods, and our savings so that our children can go to school,” said Rentina Nababan, from North Sumatra’s Aek Lung region, according to the new website. Abson Lumban Batu, from North Sumatra, is also featured on RAN’s site. “We are ready to defend our land to our very last breath, because this land is our life,” she is quoted as saying. Image courtesy of RAN. 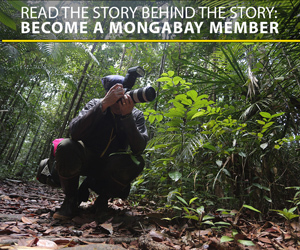 Both companies told Mongabay they were working hard to resolve disputes with communities affected by their plantations. APP said it “places great importance on building and maintaining good relationships with local and indigenous communities,” noting that its social engagement teams work “tirelessly” to address conflicts. It pointed to a recent resolution in Riding village, South Sumatra, where the community and APP agreed in April to work together to implement a social forestry scheme as evidence of its successes. TPL also said it “fully supports the process of dealing with land claims,” citing its attitude to a government ruling in 2016, which saw 5,172 hectares of traditionally-owned lands removed from the company. “This area is currently being restructured to adjust the boundaries of TPL concessions,” said TPL Director Mulia Nauli. “We allocate 1 percent of our net sales, an average of more than 10 billion [rupiah, around $751,428] annually, to conduct community development and CSR [corporate social responsibility] programs to improving the economy, health, education and infrastructure,” Nauli said in an email. TPL added that it “deplored” RAN’s campaign, which it feared would hamper conflict resolution. “Such campaigns are not productive, do not solve the problems and can disrupt the process of settlement that is being run by the government,” Nauli said. Indra Pelani, the activist who was murdered by APP security guards in 2015. Photo courtesy of Walhi. Morgan of RAN, meanwhile, said the companies needed to take “decisive and proactive steps” to implement the “free, prior and informed consent” aspects of their policies. The principle references the right of communities to veto development projects that might affect their land. Morgan added that failures by companies to realize their commitments on the ground are “unfortunately very common” and extend well beyond APP and TPL. But while she also acknowledged that conflicts predating social and environmental commitments are difficult to solve, she said companies are not doing enough. Banner image: Nurmala Boru Purba, a resident of Aek Lung village in North Sumatra, is one of those featured on the Beyond Paper Promises website. Photo courtesy of RAN.